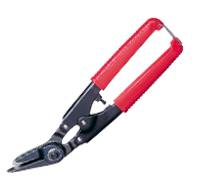 Guarantee to experience the high cutting performance and durability for many years. Easy to insert underneath strap by guide blade. 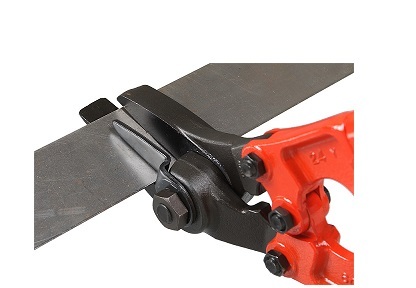 Suitable for cutting steel straps including heavy gage, tin plate, bearing hoops(?) and plastic straps and bandings. SC-0200 240 (9") 32x0.9(1.1/4x1/32) 0.30 N.A. Cutting strap sometimes becomes dangerous job. The tighten strap can flap and sharp cut end may hit you. The anti-flapping blade avoid strap from flying towards your face. This sharp edge of blade tip is not for cutting, it's for you to easily insert the blade underneath the tighten strap. Without this, you would often pull the strap up to make a room for cutter to go in. Blades are made of special alloy steel and heat treated by latest technology. This is for professional who cuts steel strap everyday. Now two models are available in market. SC-0201 for light users and SC-600 for heavy users.